The Article Galaxy Widget is a versatile browser plug-in that works on 70+ popular discovery websites. Easily injected into your browser bar, the Article Galaxy Widget instantly transforms flat search results on PubMed, Google Scholar and other discovery portals, overlaying a powerful tool that extracts all citations for simplified viewing and filtering. Download your pocket guide brimming with tips and tactics to enhance your literature search! The widget is easy to deploy, requires no IT support and is accessible via any Internet browser. Simply inject into your browser bar and see your flat search results come to life. Is Article Galaxy Widget Right For You? Article Galaxy Widget is designed for users in organizations with an enterprise license agreement for pre-authorized article purchases. Don’t have an enterprise account? 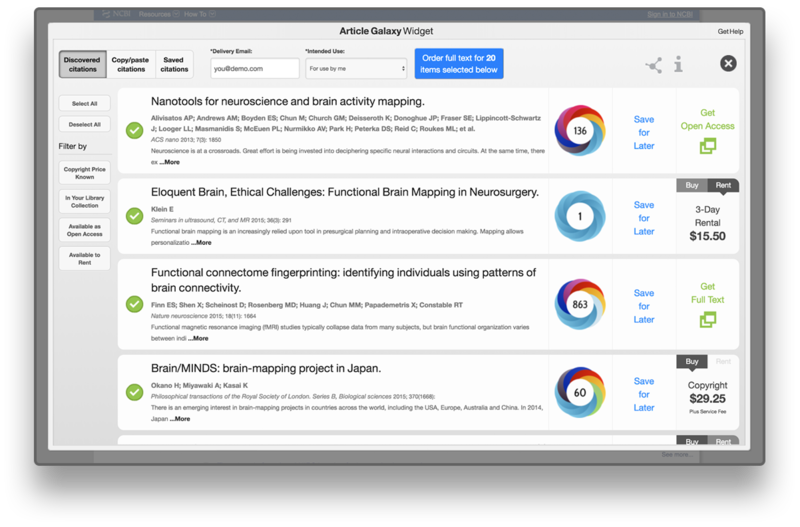 Learn how Article Galaxy can help your organization to streamline scientific literature access.